I like to use cloth bath rugs with no rubber backs for easy cleaning. Yet, I've begun to notice our bathroom rug downstairs needed replacement or renewal! (And quick!) Well wayyyy back to when I was a young mom, with no extra money to buy decorative things for the house, I remember using old fabric scraps to rejuvinate old, worn bath and kitchen rugs. I decided immediately that this old rug was not going to be replaced, but renewed! In about two hours time you can turn a bundle of fabric strips into a new rug! Yep, First, start with a bundle of fabric strips in the colors you want. Half way done and already looking better! I'm getting excited!! It's a Win! Win! for sure. Do let me know if you ever decide to make yourself one, as I'd love to see it if you do! Please feel free to link back to my tutorial and spread a little bathroom DIY love! That looks great!! I bet it'll look good when it's washed a few times and gets a bit frayed and fluffy. Aren't you CLEVER! Great idea! What a cool idea....so much prettier than the old, bleached mat. You are so interesting. I only get the kind of rugs with the non slip backing, so I can't try this out... but want to. Great way to use up all those odd scraps, very inventive and looks good too. I really love this! Did you have to use a special needle? You are so creative. No special needle used..just zoom zoom zoom. You spart girl you! It looks great and looks like it was fun! Totally CLEVER!!! Thanks for sharing such a great idea.....and with the 'how-to's' too!! What a fun and creative genius of an idea! 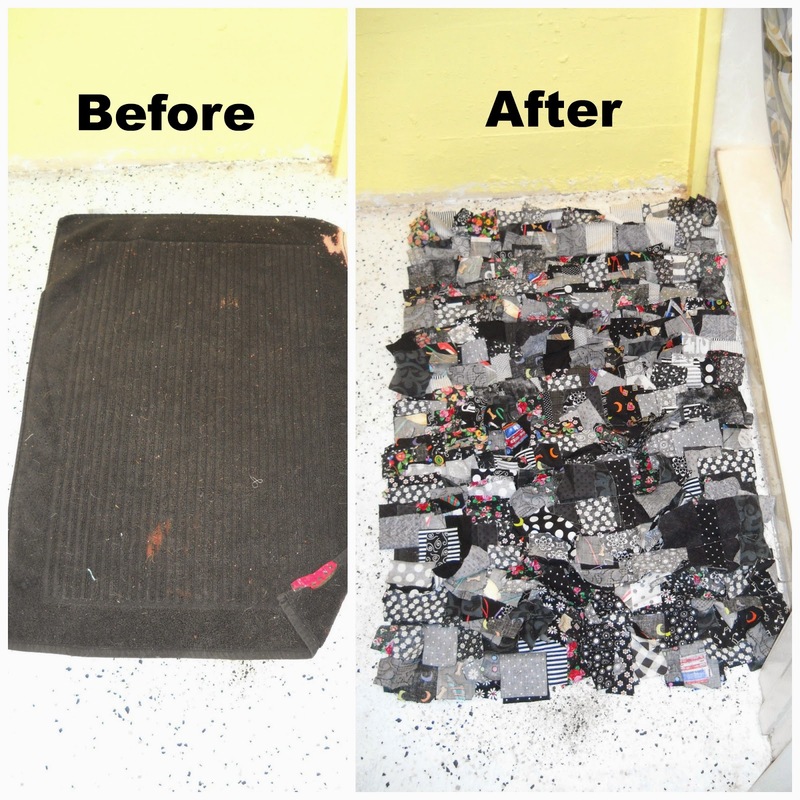 What a great way to keep on using a still perfectly usable rug! Great idea. I have an odd shaped floor and beginning to think I could make a customized rug via your inspiration here. Great use of scrap fabrics! And so lovely to see them every day too. Thanks for linking to TGIFF! This is pretty cool! My mother gave me a mat similar to this, it is made of outdated poly knits, and sewn in an oval shape. Val, that is soooo cool1 And I must say - it looks really snazzy with your shower curtain! Innovative way to use up scraps. Very cute too! Val this is so much fun... I'm thinking your home is full of interesting ways to use fabrics. What a good idea! I'll definitely be doing this or the house! fabulous idea! I couldn't find bath rugs in the color I wanted do I bought black. It shows everything! Now I can make it the color I want.